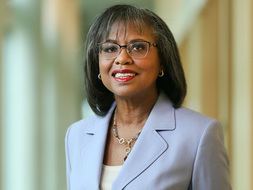 Anita F. Hill teaches courses on gender, race, social policy and legal history. Hill’s latest book is Reimagining Equality: Stories of Gender, Race and Finding Home (Beacon Press, 2011) combines the study of commercial and anti-discrimination law with an examination of culture and society to address the 2008 foreclosure crisis and its ongoing impact. Hill, Anita co-author, Anita Hill (Author),‎ Cornelia H. Butler (Author),‎ Sebastian Smee (Author),‎ Mark Bradford (Author). Mark Bradford (Contemporary Artist Series). First ed. London: Phaidon, 2018. Hill, Anita. Reimagining Equality: Stories of Gender, Race and Finding Home. Boston: Beacon Press, 2011. Hill, Anita. "A History of Hollow Promises: How Choice Jurisprudence Fails to Achieve Educational Equality." Michigan Journal of Race & Law 12. 1 (2007): 107-159. Hill, Anita. "The Embodiment of Equal Justice Under the Law." Nova Law Review 31. 2 (2007): 1-19. Hill, Anita. "What Difference Will Women Judges Make? Looking Once More at the "Woman Question"." Women and Leadership: The State of Play and Strategies for Change. 1st ed. Ed. Barbara Kellerman and Deborah Rhode. New York: Jossey-Boss, 2007. 1-29. Hill, Anita. The Scholarly Legacy of A. Leon Higginbotham: Voice, Storytelling and Narrative. Rutgers Law Review, 2001.